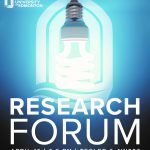 CUE is proud to recognize the research of its undergraduate and graduate students, as well as faculty, in our 4th Annual Research Forum. Click on the links below to see the abstract for the research posters being presented at the 2019 Research Forum. Dr. Jonathan Strand – Can Machines by Conscious? Mazwell Kryzanowski – The Effect of Sublethal MCPA on the Growth and Floresence of Brassica napus L.